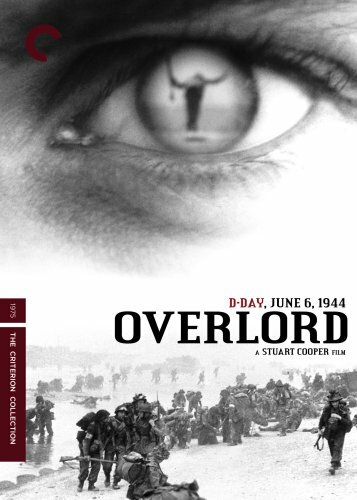 The British war movie Overlord is one of the most original and best war movies I have ever seen. Since its coming out in 1975 it has mostly been forgotten although it was highly accalimed at the time. That it is widely unknown today is really a pity. It is quite a simple movie, very short as well, only some 70 minutes, but it touches you like not many other. Overlord tells in a very personal way the story of a young man, Tom Beddows, who is going to war. He goes to boot camp, meets a young girl and knows he will be part of a big offensive that will send him to France. He will be part of Operation Overlord which was the codename of the invasion of Normandy by the Allied forces in WWII on June 6 1944 ( better known as D-Day). Tom doesn´t really want to be where he is but eventually gets accustomed to his new environment and the idea of going into battle. All through the movie he has dreams where he sees himself dying and he is quite convinced he wont return. Finally we see him being shipped out together with his comrades who are all afraid of what awaits them. As such this may not seem very special but the way this is done is just great. The movie was filmed in black and white and the story of Tom Beddows is interwoven with original footage of bombed cities, planes, bombed trains, the landing itself and many other elements. This is done so well that the alternating parts blend into each other as if they were one movie. Since it focuses so closely on one person (with just a few exceptions) it is very intimate. You get the feeling that this is not just anyone going to war but a young guy you might know and like since Tom is gentle and endearing. All the original footage, that is very well-chosen, is by far more convincing than many CGI or reenactment parts of other movies. It’s a perfect little movie that would probably even be appreciated by people who would normally never watch a war movie. Should you ever want to convince someone that the genre deserves its appreciation Overlord could be your choice to prove it. It might also be great as a way to teach WWII in schools as there is no gratuitous violence. This entry was posted in Europe, History, Movie, Recommendations, Trailer, War Movie, WWII and tagged D-Day, History, Movie Trailer, Movies, Operation Overlord, Overlord, Recommendations, Reviews, War Movies, WWII. Thanks. I can not wait to see it. Hopefully I will be able to use it in my Military History class. It’s hrd to find good non-rated R movies to show. Plus we have the D-Day Museum close by in New Orleans so the subject matter is intriguing. I am curious to hear what you think of it. I apprecaite it being short. Most war movies are way too long. I think it shouldn’t be rated R.